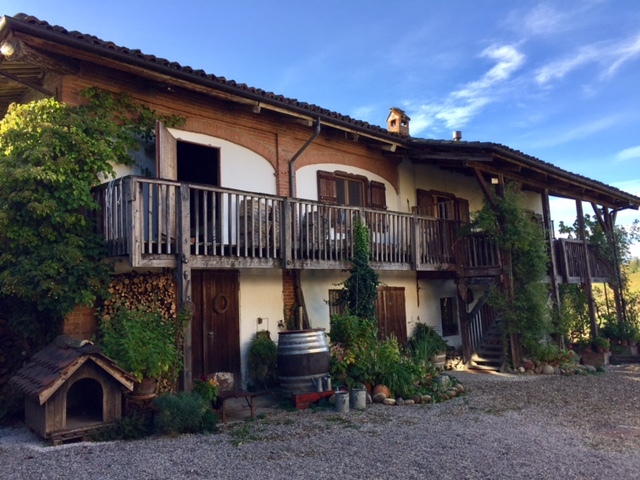 “Are you the American WWOOFers?” Our journey from Copenhagen to Le Roche winery involved a plane, 3 trains and 2 buses to reach Dogliani, Italy where a young Italian named Eduardo greeted us with this question. How funny to identify ourselves this way. We hadn’t exactly thought about it before but yes, – I guess we are American WWOOFers. - members of World Wide Opportunities on Organic Farms who volunteer in exchange for room and board. We were really looking forward to finally working a wine harvest but after our experience on the island in Denmark we were somewhat apprehensive about the next commitment. Eduardo picked us up in the car and drove us the last leg of our journey to Ursula and Marcello Reichmuth’s home and totally organic winery, Le Roche.. Ursula showed us our room for the next month. It is clean and comfortable and has a stunning view of the vineyards (hurray!). We were invited to dinner which was a delicious polenta dish -- sort of like lasagna but with polenta instead of noodles. We enjoyed it and a lovely salad with apples and beets, a fabulous dessert and lots of wine around the long kitchen table, Dinner was shared with everyone working the harvest -- Ursula and Marcello, who are from Switzerland, and the other WWOOFers – 3 Italians, 2 Swiss and us. The languages spoken were Italian, German, English and a little French. We started to feel more comfortable in our surroundings and excited about the month ahead at this beautiful winery. Our view the first morning! Breakfast was at 7:30. The first morning there was dew on the grapes so we had to wait a bit to go out into the vineyards to start picking. The moisture would dilute the juice so the grapes needed to dry in the sun before we began. One of the other WWOOFers showed us around this unbelievably organized farm. They even have clothes that we can borrow while we work. We were given clippers, work gloves and hats and we headed out to the vines. It’s definitely not easy work. It’s hot and the baskets of grapes are heavy. It is repetitive. But there is something about picking this fruit that will end up in someone’s glass years later that is extremely satisfying. Plastic baskets are spread out along each line of vines. Everyone chooses a row. And then you start picking and putting the fruit in the baskets. When the basket is full, you put it under the vines and Marcello comes with the tractor and trailer to pick up all the fruit and take it up to where it will be turned into juice. Everyone works and works hard. Mid-morning there is a break and dried fruit, water and a kind of bread/cookie is offered for energy. Then the work resumes. Ursula works harder than anyone in the field but then leaves late morning to prepare our lunch which was served outside at another long table. Dried meats and cheeses, fresh bread, an enormous bowl of tabbouleh with fresh vegetables, and an amazing assortment of everything you could possibly want feeds the hungry workers. After coffee, we head back to the vines. 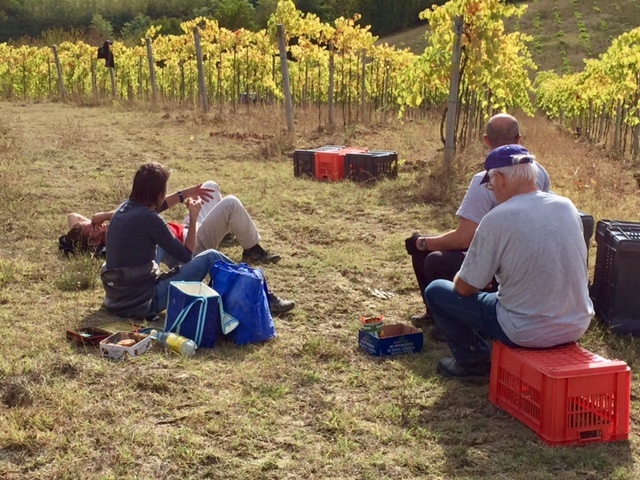 Lunch during harvest on an Italian winery! The process repeats. We pick for several hours, have a break and pick for several more hours until we finish our rows for the day. Then we come in from the field, and the grapes are taken to the machinery that removes the stems and moves the juice to the tanks to begin fermentation. We get cleaned up and enjoy a glass of wine (or 2) before another amazing meal. This year’s harvest is good! The grapes are healthy and the quality is exceptional. The quantity is not as high as in other years as it has been very dry here and they have replanted a few fields but overall, the Reichmuths are pleased with the literal fruits of their labor. We get to try the juice as fermentation starts and it is the best grape juice I have ever had in my life. 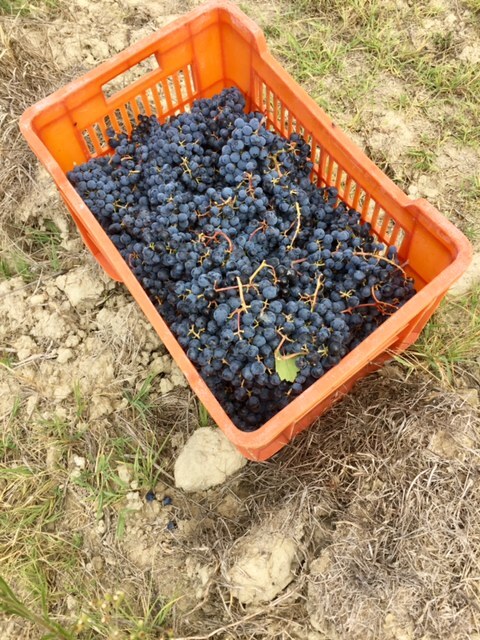 Harvest was over in 4 days which was very fast and due to the low quantity of grapes and the number of volunteers. After we brought in the last grapes, crushed and destemmed and pumped the grapes into the fermentation tank, Marcello announced it was Christmas! We all got cleaned up and he took us to an agritourismo for dinner to celebrate the harvest. The family run establishment was the perfect spot for our festivities. This seems to be a time-honored tradition that we knew nothing about but enjoyed thoroughly. The typical Piemontese meal involved lots and lots of meat, multiple courses, flowing wine from Le Roche of course and the great feeling of working together toward the goal of bringing in the 2017 harvest. We have lots more to tell you about our time at the winery and our continuing travels but will save that for another post. Next time: Lessons from the Vineyard and more. Hope you will continue to follow our adventures and think of us when you are planning your next trip! Sign up with your email address to keep up with our European adventure and new blog alerts!